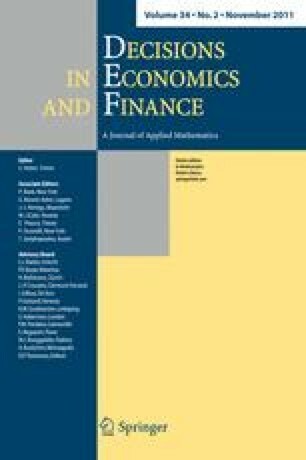 In this paper, we empirically investigate the consequences of domestic systemic risk for stock market investors. To tackle this issue, we consider two different investment strategies. One strategy is to be “crisis-conscious”, i.e., taking the possibility of systemic events into account, and the other one is to be “crisis-ignorant” and thus disregarding systemic risk. We compare the optimal portfolio choices and investment results of these strategies in an historical simulation, using almost three decades of historical stock price data. Our main findings are as follows: the crisis-conscious investor tends to choose less extreme portfolio weights for individual stocks than the ignorant investor. The overall risky investment is, however, of similar size for both. By ignoring the possibility of systemic events, the crisis-ignorant strategy performs significantly worse from the viewpoint of expected return as well as expected utility. I thank Chris Brooks, Wolfgang Bühler and an annonymous referee for helpful comments. An earlier version of this paper was titled “Portfolio Management in the Presence of Systemic Risk”.